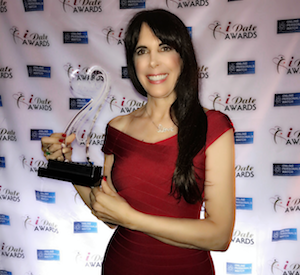 Miami, Florida –January 26, 2017—JULIE SPIRA, who ranks as the most influential person in dating and online dating, was named “Best Dating Coach,” at the iDate 2017 Awards. 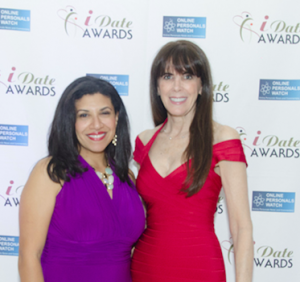 The iDate Awards represents the best dating and social networking has to offer the public. The awards include 13 categories and is the largest gathering of executives who specialize in online dating, matchmaking, mobile dating, and the growing niche dating industry. Spira, CEO of Cyber-Dating Expert, was one of five finalists in her category and received a majority of the votes. Other winners of the iDate Awards included Match, eHarmony, and mobile app, Bumble. Spira who specializes in coaching singles who are looking for love online, is an accomplished dating coach and bestseller author who helps people looking for love in the digital age. Held on location in Miami, at the Miami Beach Botanical Garden, the Internet Dating Conference is the largest trade show and business conference for the online dating, social networking, and matchmaking industries. Several business meetings are held each year covering the technology, management and marketing for the industry. The Miami conference is the largest. Held each January, it focuses on the multi-billion dollar global dating industry. Julie Spira is a dating and relationship expert who has become the go-to person in the media for online dating and mobile dating advice. She’s been featured in over 1000 media stories and has been helping singles find love for over two decades by helping them find their perfect match. It’s the first week of the year, and it’s a busy one for sure. 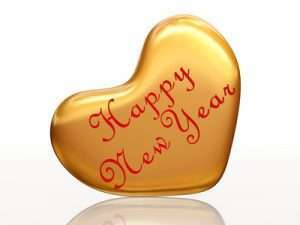 Many of you are back to work and have New Year’s resolutions which include finding love on your list. 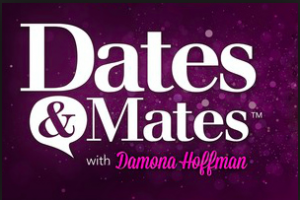 I’m so honored to announce that I’ll be a guest on ‘Dates & Mates’ radio with my good friend and TV Dating Expert, Damona Hoffman on Thursday, January 5th. Our topic will be Online Dating Week, which is going on right now. In fact, Dating Sunday, or if you’re a hashtag fanatic like I am, #DatingSunday will be the peak time for online dating signups on Sunday, January 8th. Damona’s show is dedicated to all things dating, mating, and relating and the best part is YOU can become a part of the live conversation. No other love show on the web lets you watch what happens via a LIVE STREAM from their Hollywood studio. Plus you can live tweet your questions, chat with other listeners, and download past episodes. Listen to me live Thursday 1/5 at 11 am PST on ‘Dates & Mates’. Tune into UBNRadio.com channel 1 to hear Damona and I dish about Online Dating Week. I promise we’ll have you completely armed with a digital strategy to help you find love in 2017. Sign up for our Free Weekly Flirt newsletter for dating advice delivered to your inbox, where you’ll also receive a free copy of our ebook, The 7 Secrets to Finding Love Online. 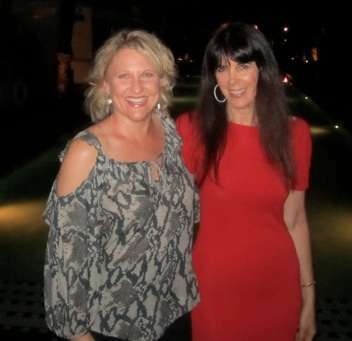 Julie Spira is America’s Top Online Dating Expert and Digital Matchmaker. She was an early adopter of online dating and was on the Internet before people even knew there was an Internet! Julie’s the author of the bestseller, The Perils of Cyber-Dating: Confessions of a Hopeful Romantic Looking for Love Online and her dating advice has been featured in over 1000 media stories. 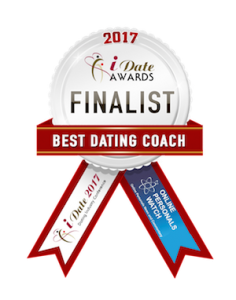 Of the many things I was thankful for during Thanksgiving week, one was the announcement of a male client who got engaged, the other was spending time with my family, and lastly, I found out that I’m a FINALIST for best dating coach in the 2017 iDate Awards to be held in Miami in January. 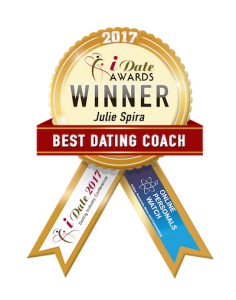 Voting is now open to the general public, so it would mean the world to me if you could cast your vote for Julie Spira – Cyber-Dating Expert for best dating coach. While I was surprised to hear I was nominated, it warms my heart to know the industry realizes how passionate I am about helping singles find love. It was over 20 years ago (22 to be exact), that I first embraced online dating during its infancy. It was before Match.com and eHarmony were even launched. After helping myself and mastering the sites and chat rooms, I then started writing profiles for singles, while still keeping my day job as a technology executive. Cosmo named me the “Pioneer of Online Dating” and after my bestselling book, The Perils of Cyber-Dating: Confessions of a Hopeful Romantic Looking for Love Online was released, my business expanded and I started writing dating advice for JDate, Match, eHarmony, Huffington Post, DatingAdvice.com, PlentyofFish, YourTango, and the list goes on. After two decades of helping singles find love online, I created Mobile Dating BootCamp, which was featured in the Washington Post, appeared in the New York Times on the growth of Tinder in 2015 and 2016, have been responsible for many marriages and engagements, several online babies, have appeared in over 1000 media articles, and have some exciting TV and film projects in the works. I credit those I met at the iDate conferences for helping me spread the news and have attended 16 iDate shows! The January 2017 iDate Awards will be my 17th time at iDate and the thought of accepting this award brings tears to my eyes and joy to my digital heart. Thank you to those who have nominated me to be a finalist and to those who are voting now that voting is open to the general public. Being a dating coach brings together two of my biggest passions; my love of technology and my strong belief in love. I couldn’t be happier. Thank you from the bottom of my heart for reading my articles, watching me on TV, reading my books, and for your vote. VOTE at iDateAwards.com from now through January 6th. It’s an honor to be a featured speaker at the Internet Dating Conference, iDate-2016 to be held in Miami, Florida on January 25 – 27th. iDate is the online dating and mobile dating industry conference with executives from online dating sites and matchmakers who will meet to discuss the latest industry trends. Cyber-Dating Expert has been attending the iDate conference for the past eight years and is a proud sponsor of the Internet Dating Conference. We all know that online dating is a HOT topic in the news. My panel, Managing the Headlines: How to Get Press will be held on Wednesday, January 27th at 2pm at the Kovens Conference Center in Miami, USA in room 110. My presentation will immediately follow the session, Match.com Going Public and Projected Forecasts for the Dating Industries, presented by Mark Brools of Courtland Brooks and Alex Harrington from Snap Interactive. In my session, we’ll discuss the hottest news stories of the past year. I’ll talk about which headlines to respond to and which ones to avoid to show your business in the best light. From Tinder pro to Valentine’s Day, I’ll be sharing my secrets on how I became a top online dating expert and go-to person in the media, having been featured in over 650 news stories on the subjects of Internet dating and mobile dating. I’ll also be presenting the award for Best Mobile Dating App at the iDate Awards on January 26th, so grab your tux and gown and head on down to Miami. Join me at iDate in Miami. You can purchase your tickets here to save $75 on your registration. Julie Spira Cyber Dating Expert on Managing The Headlines at iDate 2016 Dating Business Super Conference VIDEO. Follow me on Twitter @JulieSpira, where I’ll be sending out live updates from iDate-2016. If there were Academy Awards given for the best Internet dating sites, it would be at the annual Internet Dating Conference, held in Miami Beach, Florida on January 23 -30, 2012. This year, you can vote for your favorite online dating site, favorite mobile dating app and more. The last day to vote is January 4, 2012, so grab your iPad, iPhone, BlackBerry and log onto InternetDatingConference.com to cast your vote. This year, iDate will include a special post-conference cruise to the Bahamas. Winners of the iDate Awards will be announced at the 9th Annual iDate Super Conference on January 24, 2012. Cyber-Dating Expert is proud to be a media sponsor of the iDate 2012 Conference. We’ll be reporting on the latest dating trends and will keep you posted on the latest developments. Once again I had the pleasure of attending the Internet Dating Conference which was held in Miami Beach last week. The highlight this year was the first-annual iDate Awards where both industry leaders and the public had the opportunity to vote on their favorite online dating sites. The next iDate conference will be held on June 17-18, 2010 in Miami Beach. I’m secretly hoping that CyberDatingExpert.com gets nominated for an honorable mention. Join Cyber-Dating Expert Julie Spira on Saturday, January 23, 2010 as she welcomes Michael Lombard, CEO of Lovetropolis to Ask the Cyber-Dating Expert Radio Show. Lovetropolis.com modernizes online dating by providing instant messaging, virtual flirts, interactive chat, live webcam dating, personality matching, audio/video profiles, horoscopes & lovescopes. We’ll hear about their expert features including Chef Jay?s recipes,? dating and relationship advice and a savvy online magazine provide fun hints that will augment romance, dating and relationship skills. Lovetropolis.com has been reviewed as ?The Next Great Dating Service? by Robert Lee from AloveLinksPlus. The site was just nominated as a finalist in five categories for the 2010 iDate ( Internet dating) Awards scheduled for January 28, 2010. Learn more about this new Internet dating site and about dating, love, and romance in a Web 2.0 World.